Hello Celes! I read your talent article and have a question. I mean, when I listen to voices like Whitney Houston, Mariah Carey and Christina Aguilera, they must have an innate gift. Why are there are no other singers like them? I don’t know what to believe about talent, if it really does exist. Hey Sarah, it is true that some people have a higher propensity for something over others. Some people may have a natural talent in singing, some in drawing, and others in writing. Different people seem to have inclinations toward certain crafts and mediums, there’s no doubt about that. For example, I’m not a particular fan (or hater) of Justin Bieber, but watching a clip of the 13-year-old him playing drums, it’s undeniable that he had rhythm at a young age. Bieber taught himself musical instruments such as piano, drums, guitar, and trumpet growing up and as we know, he’s a mega teen-star today. Then we have Mariah Carey who, like you said, has an astounding voice. She has a five-octave vocal range and is able to reach notes beyond the seventh octave. She is coined the “songbird supreme” by the Guinness World Records and was placed second in Cove magazine’s list of “The 100 Outstanding Pop Vocalists/” Her singing prowess is almost second to none. Looking at other crafts like acting, it’s obvious that some actors are simply naturals. There’s Robert Downey Jr., Johnny Depp, Leonardo DiCaprio, Robin Williams, Anthony Hopkins, and Morgan Freeman, actors who bring whatever characters they are acting to life. Actresses-wise, we have Meryl Streep (Devil Wears Prada), Nicole Kidman, Drew Barrymore, Gwyneth Paltrow (Sliding Doors, Iron Man trilogy), and relative newcomer Jennifer Lawrence (2012 Academy Award Best Actress winner for her role in romantic comedy Silver Linings Playbook) who have an immaculate touch to their character portrayals. Lawrence has been hailed “the most talented young actress in America” by Rolling Stone for her spot-on performances to date. That said, there’s hardly merit in being disgruntled with innate talent. For example, if we really want to talk about what’s fair or unfair, it’s hardly fair that Helen Keller, iconic author and political activist, had her sense of sight and hearing robbed from her from birth, due to a childhood illness she had no control over. As a girl, she never got to experience for herself a world with colors or sound. She continued living this way till her death at the age of 87. On the other hand, most of us here are able to see and hear to some fair degree. We were born this way and we didn’t exactly do anything to “deserve” this; these privileges were simply given to us at birth. 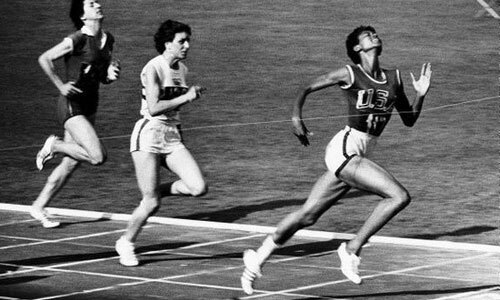 Then there’s Olympic champion Wilma Rudolph (1940–1994), who — at the age of four — was paralyzed after being hit by infantile paralysis (among other deadly illnesses fever such as double pneumonia and scarlet fever). The doctors told Wilma’s mom that she would never walk again, at least not like a normal child would. But Wilma never gave up. She pressed on and struggled to walk with her steel brace, to the point where she could walk without her steel brace during her ninth birthday — amazing even her doctors! Subsequently, Wilma pushed her limits to the point where she could not only walk without a limp, but run: at the age of 16, she joined her high school track team and progressed from the girl who always limped into the last place at every race to the girl who won every single race she entered. It wasn’t long before Wilma was selected to represent America in Olympics in three events: 100 m sprint, 200 m sprint, and 4 x 100 m relay. Believe it or not, in the 1960 Summer Olympics, Wilma became the first American woman in history to win three gold medals in track and field during a single Olympic Game — on a sprained ankle. She was thereafter hailed as “The Tornado, the fastest woman on earth”. And yes, we’re talking about the girl who was paralyzed as a child, but somehow, through sheer grit, faith, and a touch of a miracle, regained her ability to walk, to the point where she could outrun even people who were born healthy without any disability. I was at Her World Woman of the Year 2013 event last week, and the Young Woman of the Year Achiever this year, Dr. Yeo Sze Ling, is blind. She was diagnosed with glaucoma at the age of four and lost her ability to see anything but just light. If you ask me, I don’t think that’s fair at all. Watching her on stage giving her thank-you speech, it’s obvious that she has risen above what most in the society would see as decimating condition: she is humorous, jovial, and bubbly; is able to make light of people’s awkward responses to her “disability” (including her own niece), and is humble despite her achievements (she won the Singapore Youth Award 2012 too). Not only that, but she makes a point to give back to others by translating books for other visually impaired students and tutoring students in Mathematics in her personal time. Dr. Yeo Sze Ling, research scientist at A*STAR. She became blind at the age of four after being diagnosed with glaucoma. On the cover of The New Paper on Aug 24, 2013. The local Prime Minister spoke of her during the National Day Rally. Inspiring? I definitely think so. I don’t know who were the other nominees (it was a closed-doors selection process), but I can clearly see why she was given this award. 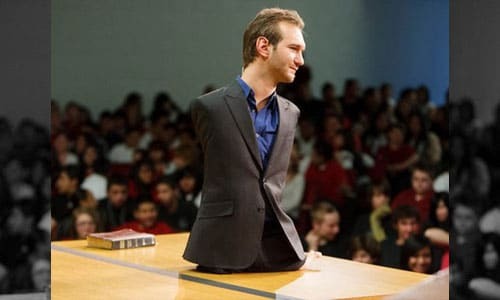 Last but not least, we have Nick Vujicic: a man born with no hands nor legs. Not fair, for sure. He studied in mainstream education, became a target for the school bullies, and fell into a severe depression, following which he contemplated suicide at the tender age of eight and tried to drown himself in his bathtub when he was ten (but thankfully did not succeed). Nick later decided to be grateful for his life and embrace his lack of limbs. He figured out how to live a life without hands and legs. He learned to type, comb his hair, brush his teeth, answer the phone and even shave; learned to participate in golf, swimming, soccer, and sky-diving; and even learned how to use the computer, being able to type up to 43 words a minute. He also began giving talks in his prayer groups to inspire others. He later graduated with a double-major degree and became a motivational speaker. Today, Nick is a legendary figure inside and outside of motivational speaking. To date, he has addressed over three million people in over 24 countries. Nick is an Australian but had he been born in a third world country, he might have been killed at birth because people with disabilities are considered a curse there. …are all people who had obvious disadvantages since their early lives. Don’t they have a bigger reason than us to be declare life as unfair? Yet these individuals chose a better path: they chose not to let their supposed “shortcomings” bring them down. They instead worked hard to defeat the odds and rose above and beyond even fully-abled people in their respective fields. I get why you may feel unfairness over supposedly not having any innate gift. It would be great to possess an innate talent of some sort, naturally excel in your craft without too much work, and easily sail on your road to success. It’s always nice to be deemed as some sort of child prodigy, gifted since young, and destined to succeed regardless of circumstances. However, stories of that one man/woman who magically ups everyone by virtue of his/her talent alone are usually grossly simplified, heavily misrepresented, and unbelievably exaggerated. As I’ve written in 10,000 Hours to Develop Talent, many super-achievers today have spent ten thousands of hours developing their skills despite widespread belief that their ability is purely innate. Lady Gaga for example is a multi-talented singer and musician and also the best-selling female singer of our time with over 80 million records sold to date. The world only knew about Gaga in 2009, when her career started taking off with her “Just Dance” hit. Yet, Gaga had spent nearly two decades honing her craft before receiving that career breakthrough. She started playing the piano when she was four, wrote her first piano ballad at the age of 13, constantly took up lead roles in high-school productions, and started performing at open mic nights at the age of 14. While she was constantly booed off stage in her early career, she never let that get her down, instead using them to fuel her tobecome better. Gaga would also enter a musical theater training conservatory at 17 to further her musical skills. Gaga has been writing songs, singing, and playing music all her life LONG before she became famous. Most people just aren’t privy to the work that went on behind the scenes to get as good as she is. Even if she was born with a musical talent, it would have fallen flat without her endless hard work. The latter has clearly played a bigger role in shaping her success today than whatever talent she was born with. Another example: Michael Jordan who is repeatedly acclaimed as the greatest basketball player of all time. However, did you know that Michael was rejected from his varsity basketball team when he was 15? That the varsity coach found him too short to be placed there? 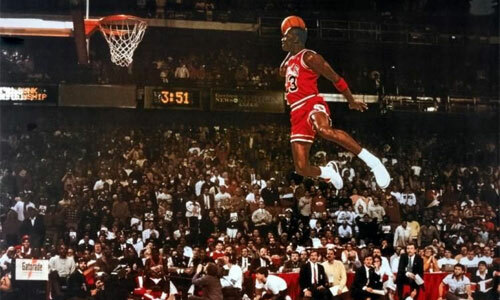 (Jordan was 5′ 11″ or 1.80 m while the cutoff was 5″ 12′, or 1.82 m.) Also, while Michael could play, “his shooting was merely good and his defense mediocre” (to quote his high school coach). Michael was instead placed in the junior-varsity team. Given that no one in the Jordan family history had ever reached over six feet, Michael had little reason to believe that he would ever get to play at the varsity level. Michael then made it his goal to grow taller. He trained intensively, cut classes, and practiced basketball every day after school with his older brother Larry. He became the star of the junior varsity team, tallied several 40-point games, and grew four inches taller (that’s 10 cm), which then earned him a spot on the varsity team. This would be only the precursor of his legendary basketball career. Would it have mattered if Michael didn’t grow taller? No, actually I doubt so. Michael’s competitiveness was already evident in him as a kid: he refused to let anything stand in the way between him and the sport. If Jordan distinguished himself at all during the tryout, it was through his supreme effort. He was first in line for the conditioning drills, and he ran them as hard as anyone, and when they were over he wanted to run some more. My intention of sharing the above examples is not to undermine talent nor to ask you to duplicate Gaga’s or Jordan’s paths. Not at all. I recognize that talent has merit. I also recognize that everyone is different and not everyone is going to be as dedicated as Gaga or Jordan in pursuing their craft and developing their skills in their passions (or, are you? 🙂 ). to point out that innate talent, whatever amounts we were born with (or not), isn’t something worth agonizing over. Not only is it not within our control, it’s also not as big of a determinant of success as you may think. 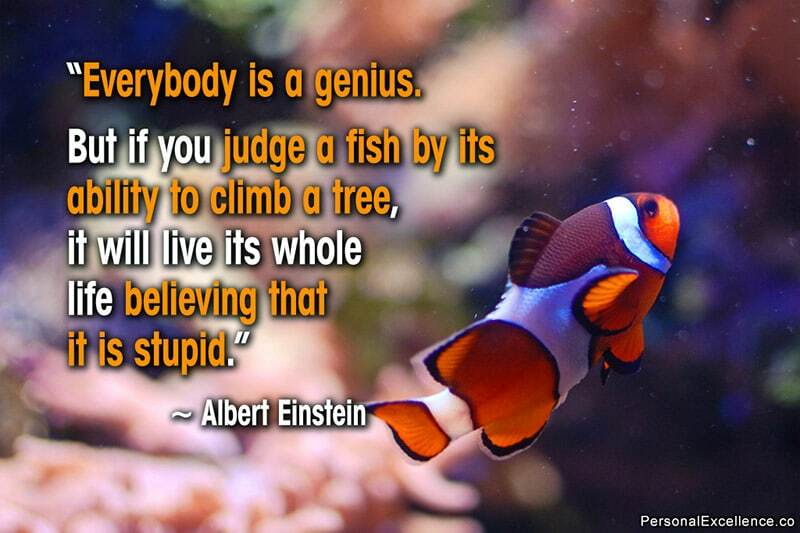 Talent would play a big role in one’s life success: only if the person did absolutely nothing to build on it. But that would also mean the person would not get far too (if he/she was even going to succeed based on solely talent and no work to begin with). On the other hand, by pumping in endless hours of hard work in investing your craft, you reduce the role of talent from 100%, to 75%, to 50%, to 25%, to 10%, to 5%, to 1%, to 0.1%, to 0.01%, then eventually to the point where it has little irrelevance in your personal success. Rather than compare yourself with people like Whitney Houston, Mariah Carey, or Christina Aguilera (who are all goddesses in their own right), why not craft your own path, be the best person you can be, and shine in your own light? Rather than lament over what others seem to have over you at birth or in life, why not be thankful for your life, your health, your working mind and your able body, and think about how to further yourself towards >your goals? Think about what you love to do because while skill can be built in any area, but passion can’t. Think about the message you want to spread to the world, then craft your path to achieve that. Get better by developing your skills, leveling up, and putting in your 10,000 hours. That’s what I have done for myself in the past five years when I started in a field completely different from what I studied in school (marketing). My writing, speaking, and coaching skills today have all been built through thousands of hours of in-field doing. Read my passion series on how to start pursuing your passion and turn it into a successful career.